Our roots were built from the iron and steel industries of the Northeast of England, the engineering legend Whessoe, and Varec, the original pioneer for tank gauging and inventory management in the USA. Varec was a key component of the Whessoe Group of companies during the 1980s and 90s. During that time the group designed and produced marine tanker and tank farm inventory management systems for worldwide distribution. 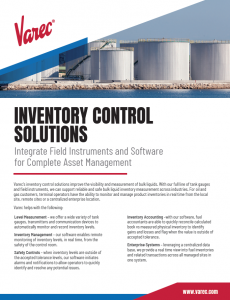 Today, Varec is the only company from the Whessoe Group that actively manufactures and supports inventory systems for the oil & gas industry. If you have questions about your existing whessoe system contact our European office for advice and support. Those involved in Work Services Management or Project Management for petroleum storage depots, oil fuel depots or aviation fuel installations on Ministry of Defence Estate are already familiar with Defence Estates Organisation Specification 044 – Fuel Measurement. 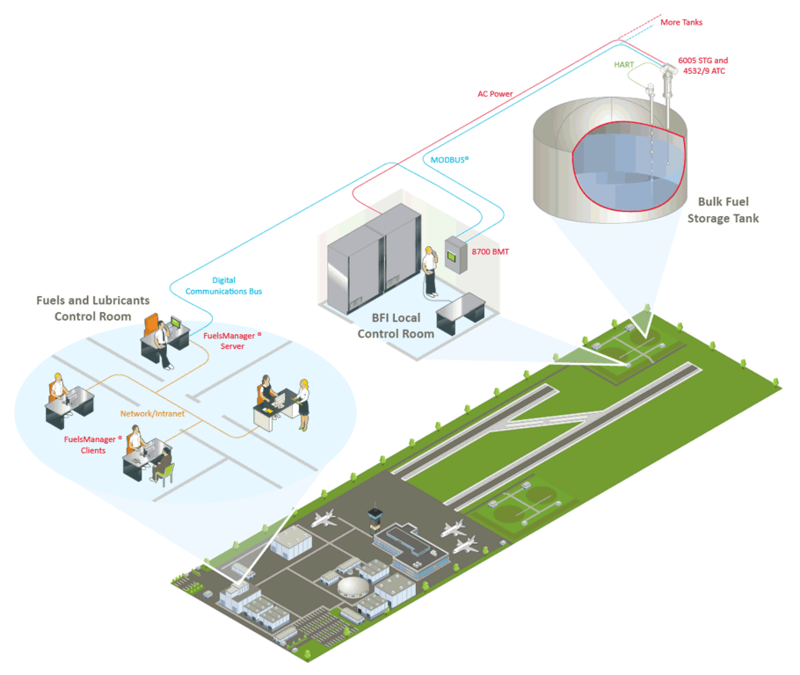 Across the UK, these facilities operate one or more bulk fuel installations, often called BFIs, which normally consist of 1-4 tanks with individual capacities ranging from 1.5 to 2.5 million litres. Many of these facilities currently operate out-dated or inoperable instrumentation from manufacturers that are no longer able to service or replace the equipment. Much of this equipment is also incapable of meeting Specification 044 in order to safely manage and accurately report current fuel stocks. Specification 044, section 3.4 recommends two types of measurement technology, servo and radar ‐ Varec is able to provide both solutions. 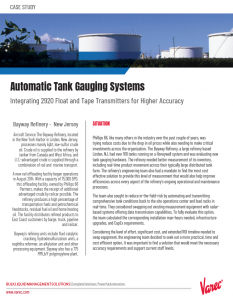 The servo tank gauge is recommended for BFIs because it offers the same accuracy as a radar gauge (+/‐ 1mm) with the added benefit of measuring fuel density (+/‐ 5Kg/m3) and water bottom (+/‐ 2mm). Varec provides a choice of Averaging Temperature Converters (ATC) devices, including the 4532 ATC and the 4539 ATC. Both devices use Pt100 temperature sensors and are seamlessly integrated with servo gauges or other instrumentation via the intrinsically safe HART communications interface. They use the connected instruments level reading to only account for the submersed elements to provide an average temperature measurement to an accuracy of +/ 0.5 Deg Celsius. The 4539 ATC provides the option for spacing measuring elements at any distance, allowing the 10 elements evenly spaced from the tank bottom to the maximum fuel level as outlined in Specification 044. The 4532 ATC provides a less expensive solution by using the industry best practice of spacing the elements at a fixed 2m interval. 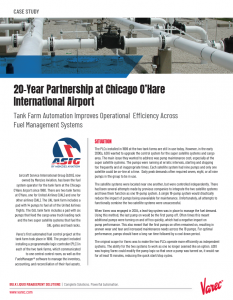 The 8650 Operator Interface Terminal (OIT) allows fuel inventory management from the local Bulk Fuel Installation (BFI) control room. The built in touch screen provides operators with a real-time view of inventory data, such as level, temperature, water level, density, standard density, gross volume, water volume and/or net volume. The system eliminates the need to perform manual inventory calculations, automatically calculating density and net volume calculations to Petroleum (now the Energy Institute) standards. Operators are also able to issue commands to a Varec 6005 Servo Tank Gauge, such as find water/bottom, measure density and raise/lower the displacer. The 8650 OIT is fully compatible with Varec’s central control room system, FuelsManager. All Varec products are backed by a one year manufacturer’s warranty. In addition, we and our service partners can provide annual gauge calibration and system integrity verification. These services go beyond the typical calibration checks offered by other vendors and include an independent system health check, verifying the overall BFI system accuracy, integrity and safety. The specific verifications to be performed will depend upon your facility’s functionality, but includes instrument calibration, field communications, safety interlocks and predictive failure analysis. For assistance with any system issues outside of the planned maintenance visits, Varec provides a 24/7 technical support centre staffed by product experts familiar with all aspects of MOD fuelling operations.